For more than 40 years, KraftMaid have been committed to the needs of their customers. 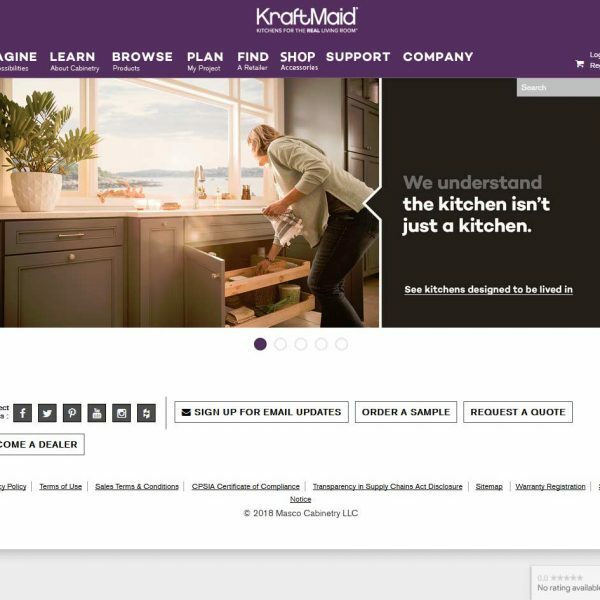 As an industry leader and one of the largest built-to-order cabinet manufacturers in the United States, KraftMaid help more customers create the home of their dreams than any other cabinet manufacturer in the world. KraftMaid cabinets are assembled in the United States. With more than 1.5 million square feet of manufacturing facilities in Northeast Ohio, they bring you the same kind of hand-crafted all-wood, dovetail drawer boxes and I-beam constructed cabinets that were sold from their modest shop over 40 years ago. Why choose KraftMaid Cabinets? Because semi-custom kitchen cabinets give you the perfect blend of style, selection, and affordability. With semi-custom cabinetry, you get to enjoy customizing your cabinetry design without the steep prices and extended lead times that often go with fully-customized cabinets. 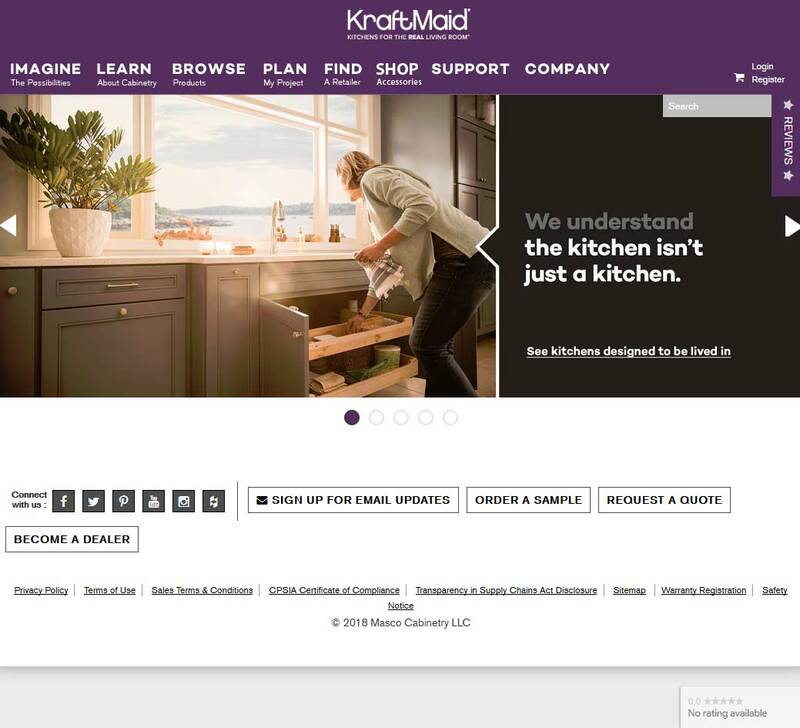 The KraftMaid product is 100% built-to-order. Through state-of-the-art construction methods, KraftMaid use the finest materials to build each cabinet to your exact specifications. You choose your door style and the type of material for your semi-custom kitchen cabinets, whether that’s oak, cherry, maple, birch or hickory. Then, you complete your cabinet design with your choice of finish and decorative hardware. 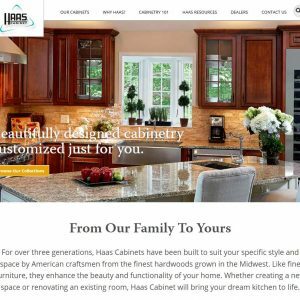 KraftMaid are part of the Masco Cabinetry group of companies based out of Middlefield, Ohio. 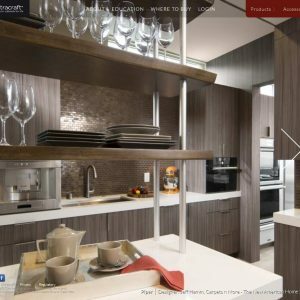 As part of a kitchen cabinetry brand including Quality Cabinets and Merillat, Masco have a cabinet design of a quality and price point to suit any home owner. Just finished a complete renovation of our kitchen. Everything new, along with refinished wood flooring. We ordered a higher end finish with many extras. Had three pieces arrive damaged. Not bad out of a total of 24 cabinets. Home Depot installer handled all the reorders. I must say, it does take awhile to get things replaced. That’s why I took off a star. But the cabinets were very well constructed. I did order several in all plywood construction and some standard. Both versions were well made. Especially beautiful was the finish; a coco glaze and cream on maple. Very satisfied. So…the issue seems to be damage in transit and replacement times. Keep that in mind as you set your project schedule. Otherwise they are great. Ordered full kitchen of cabinets & drawers through Home Depot, over $16,000.00, for a new million dollar home. Loved the design and color choices, soft-close drawers, and semi-custom options for the price. At nine months, a joint has broken in a corner of a mitered glass cabinet door. We were told to send pictures and a request for warranty coverage, and KM would respond “in 6 to 12 weeks”, itself an unreasonable review time. The claim was denied in a form letter stating that the warranty excludes any damage caused from “normal wear and tear”. I explained that this wasn’t normal, there was no “wear and tear” from our very limited use (second home); but we were told “normal wear and tear” means any use of the cabinet. In other words, once you use the cabinet, there’s no more warranty. Also, I was told the color is no longer made so I couldn’t buy a replacement door at full price if I wanted to. We have noticed several other joints separating in other cabinets. We will likely either hire a carpenter to go through all cabinets, & hire a painter to match the paint color, or replace all cabinets next winter. Absolutely horrible experience so far with customer service. Ordered cabinets in Feb; sales rep didn’t put them into the system for almost a month. 2 months later we got them and half were damaged. They tried to blame us and we didn’t even touch them; left them for the Lowe’s installer to do so. It’s been a month and still no replacement cabinets. Kraftmaid folks have consistently lied to Lowe’s about the order, putting the burden on them. Terrible company. Wish I’d read the reviews first. Am dreading the day I have to call for warranty work – which from what I’ve read is in my future – as that process is evidently even more arduous! It is not cheap to redo your kitchen. However, renovating a kitchen is the best dollar for dollar costs back to you. We sold a home a few miles away and decided to scale down as we approach our retirement. We had a smaller home that we rented out for two years. My goal was to create a Tuscan villa. We moved in and now we have our own Tuscan villa . Kraftmaid came through for us. We have used Kraftmaid in many of our renovations. Nothing is 100% smooth all the time, but overall we are very pleased. Unfortunately the handle spacers into which the screws insert are very easily strpped and Kraftmaid will not replace the spacers, but they tell the customer that they can only sell the customer a new handle. I was referred to “cabinetpart.com” to see if I could find the defective part. Important: all reviews for KraftMaid should comply with our review policies here.